The Swarovski Crystal Prisms from SWAROVSKI ELEMENTS are the finest quality precision-cut crystal prisms in the world. Swarovski Crystal Prisms are exceptionally gorgeous elements primarily displayed in chandelier and/or lighting fixtures, which is an ideal setting to showcase the captivating brilliance of each crystal matrix. Strass is the official trademark name of the Swarovski Prisms and each piece can be identified by the Strass signature as a guarantee of authenticity. If you're looking for a new way to embellish your favorite belongings, then you should definitely look at our vast selection of Swarovski Crystal prisms. Available in a wide array of colors and shapes, these prisms are sure to add lots of flare and sparkle to all of your favorite items. Many people use them to create unique and luxurious gifts, from hanging prisms for a car or window and Christmas Tree ornaments to simple or elaborate chandeliers for dining rooms or children’s bedrooms. The quality of the brilliance is impeccable and certainly catches your eye, creating rainbows of all shapes and sizes. When you invest in Swarovski Crystal prisms, you can rest assured you’re investing in some of the most beautiful prisms in the world. These stones go through a precise cutting process to ensure their beauty and glimmer can be seen from all angles. You can take comfort in knowing that these high-quality prisms will last for many years to come. Whether you’re using them to make oversized jewelry or a striking chandelier, Swarovski Crystal prisms work well on almost any project where you want to admire and display how the light reflects through the prism in a spectacular way. One of the neater projects that crystal prisms have been used for: making hanging wind chimes. The stones can easily be used in combination with other types of wind chime accessories, including noodle beads, bells, glass beads and other types. When making a hanging wind chime with crystal prisms, keep in mind that the stones can chip. Although they are of high quality and extremely durable, the wind chimes should be brought in during severe storms to ensure your crystal prisms stay in the best possible condition. Some of the more popular prisms sold by us include Moon Prisms and crystal ball Prisms. 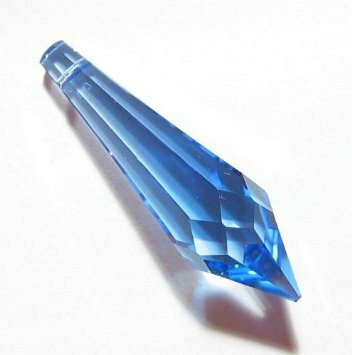 All of our crystal prisms are available in various colors and sizes, ensuring that we can meet all of your arts and crafts needs. Many customers use the stones and prisms to make their own jewelry, allowing them to easily personalize and customize their pieces to complement any outfit and occasion. When was the last time you made a custom-designed present or gift for someone? If it’s been a while, you should consider making items using chandelier crystals. These types of stones have been through a rigorous process to ensure their glimmer and glistening last for many years, and they work great as an embellishing accessory or home décor item. If you have any questions about crystal chandelier prisms, Rainbows of Light is here to meet all of your needs. Whether you’d like to create a reflective chandelier, window hanging element or use them to make a wind chime, Rainbows of Light has the perfect selection of Swarovski prisms for you to choose from.